SeaMetric International AS, Stavanger, Norway has during December 2007 ordered a package of 24 MAN Diesel marine generating sets type 8L27/38 for four specialised heavy-lifter transport vessels. Additionally, a Memorandum of Understanding has now been agreed upon between MAN Diesel and SeaMetric International for future identical GenSets to power planned newbuildings. The agreement was officially signed on Friday 18th of January, at a special ceremony at the Copenhagen DieselHouse. The GenSets ordered (six sets for each vessel) will power a diesel-electrical propulsion and positioning system with four thrusters, specified for SeaMetric’s new TML type heavy-lifter ships. TML is the abbreviation for the innovative Twin Marine Lifter system developed by SeaMetric. Two of the dynamically positioned (DP3 type) heavy transport vessels are 140 m long, with 40 m beam and have a dwt capacity of 25,000 tonnes, whilst two are 180 m long with same beam and have a dwt capacity of 35,000 tonnes. They will have accommodation for 41 persons, a helideck, and will be capable of submersion to -20 meters. As such, they will be capable of transporting very large construction sections, the world’s jack-up drill rig fleet and the majority of semi-submersible drilling rigs as well as topsides modules and other major loads. “By having a DP Class 3 heavy lift system and accommodation facilities, we will not be dependant on anchor handler vessels, tugs, daily helicopter shuttling and accommodation offshore, which will reduce the operational costs significantly. We will also be capable of secure operation in congested areas and above subsea pipelines. The flexibility of use of the base vessels in the heavy transport market will maximise our utilisation and therefore improve our potential profitability” says Managing Director of SeaMetric International, Johan F Andresen. The Chinese CNPC, Liaohe Shipyard will deliver the first vessels in the 4th quarter of 2009. The GenSets, which are of the classic MAN Diesel Holeby design with common baseframe for engine and alternator, will be supplied from the South Korean MAN Diesel licensee, STX Corporation during 2nd and 3rd quarter of 2009. The ships’ GenSet package is specified as 6 x 8L27/38 – in order to meet the special operating demands of each of the four newbuildings with accumulated GenSet outputs of 15.840 kW (21.500 BHP) mechanical power. SeaMetric International AS, founded in March 2000, is a limited liability company focusing on cost effective and safe marine services and operations in the offshore oil and gas industry. SeaMetric International AS has developed the revolutionary Twin Marine Lifter (TML) system for installation and removal of very heavy objects like platform topside and jackets with weights up to 20,000 tonnes. Mr. Niels Henrik Nielsen, Area Sales Manager, MSG, MAN Diesel Holeby (left) and Mr. Leif Erik Haugen, Contract Director, SeaMetric International – shaking hands after signing the Memorandum of Understanding for future GenSet solutions. 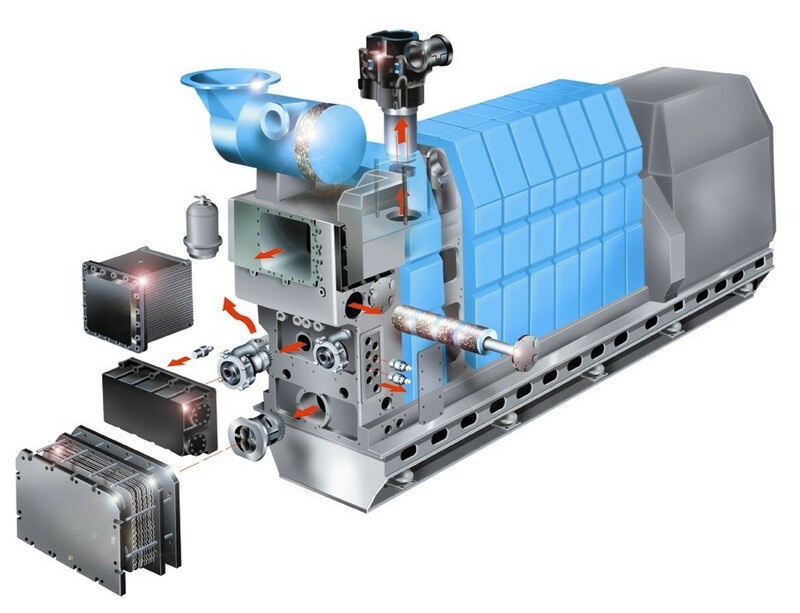 The chosen GenSet concept based on MAN Diesels modularised and service-friendly L27/38 generating sets – six units for each vessel.